Get a great deal on the the Smoant Cylon 218 vape mod from Vapor DNA. Leave it to Smoant to close out the year with a bang. 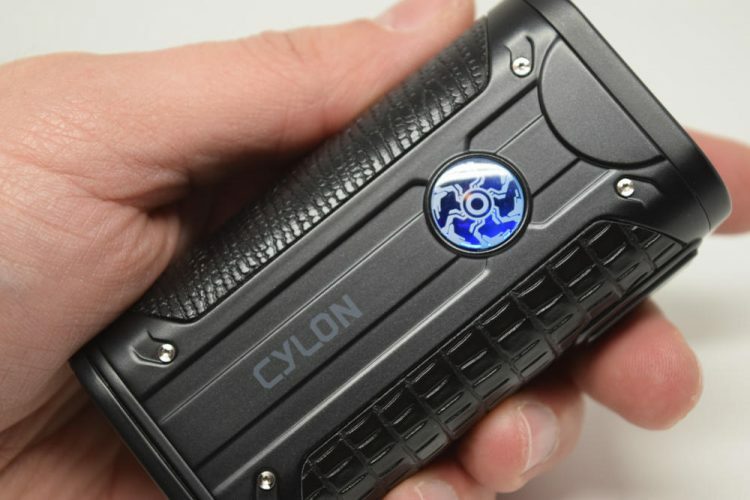 They’ve managed to do just that with the release of the Cylon 218, a dual-18650 battery mod featuring an eye-catching design, an updated chip, a gorgeous 1.3-inch TFT color screen and tons of customization options. It hasn’t even been officially released yet, but I have a feeling that the Smoant Cylon 218 will one of the most talked-about vaporizers of 2018. 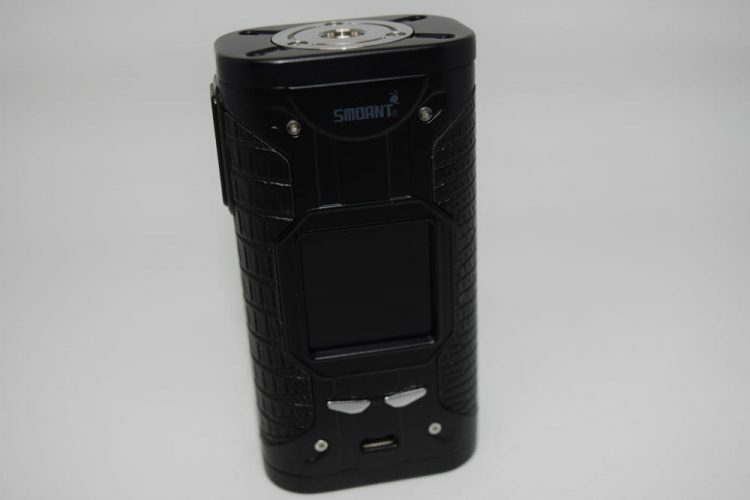 The Smoant Cylon comes in a white cardboard box with a large RPM gauge on the front, and a list of contents, company information and a scratch-and-check authenticity sticker, on the back. That gauge I mentioned is actually one of the two available screen layouts of the mod, and one of the coolest features of this device. Inside the box, we have the Cylon 218 mod, a micro-USB cable for charging/firmware upgrading, an instructional leaflet, and a bunch of quality control and battery safety cards. The Smoant Cylon 218 is one of those mods that people are either going to love or hate. I can’t imagine someone looking at it and thinking “it’s ok”, they’re either going to fall in love with it or detest it. There’s a lot to take in, and it may a little too much for some people. First of all, the Cylon is not the most compact dual-18650 mod on the market. It measures 90 mm x 47 mm x 32 mm, which makes it 1 mm taller and 1 mm wider than the iJoy Captain PD270, only the latter fits 20700 batteries as well as 18650s, while the Cylon is limited to 18650s only. That’s a bit of a con in my book, as Smoant could have definitely made this thing compatible with larger capacity batteries as well. Why they chose not to give users more options in this regard is a mystery to me, but it definitely feels like a missed opportunity. That said, the Cylon 218 does look and feel like a very solid device. It has a zinc alloy body, with faux-leather inserts on both sides, for improved grip. I’m really digging the texture of the two leather pieces, they feel like snake or crocodile skin to the touch, and really do improve the grip quite a bit. 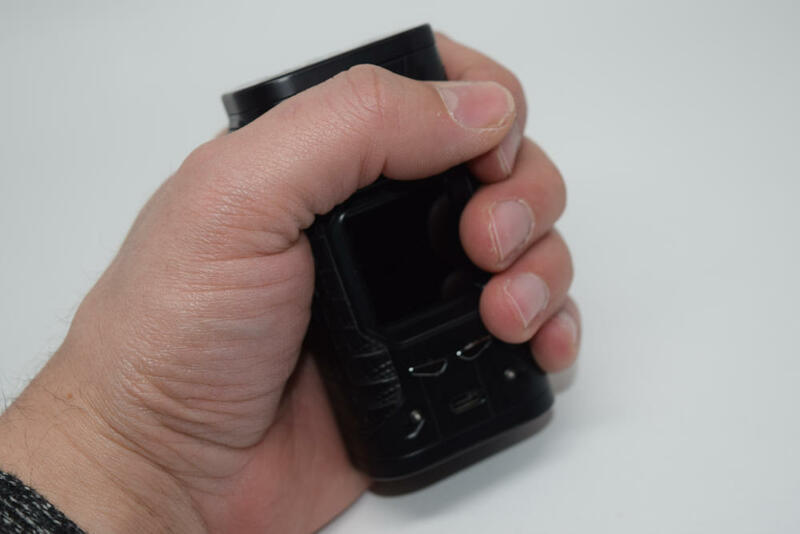 The 1.3-inch square display is located right in the middle of the mod, but instead of being flush with the mod, it’s actually pushed in a couple of millimeters, which should offer it some extra protection in case you drop it or bang the mod against a hard surface. The TFT color screen is definitely one of the main draws of the Cylon 218. It’s not quite as large as that of the Wismec Ravage230 (1.4 inches), but it makes up for that by being considerably brighter. The colors are vibrant and the resolution is very high for its size, so everything looks nice and sharp. Smoant really hit it out of the park with this display, that’s for sure, and they actually take advantage of it by including different screen layouts and a number of cool wallpapers. 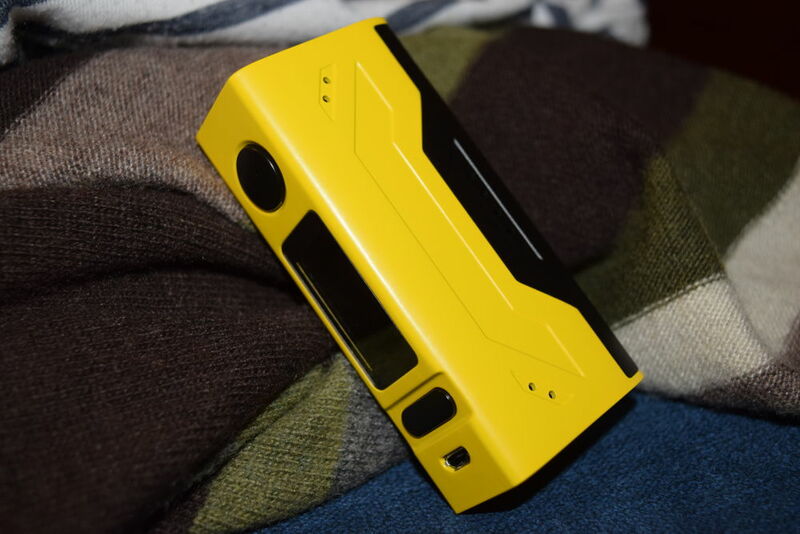 While reviewing the Wismec Ravage 230, I was thinking that every manufacturer should switch to centered 510 connection, so I was very pleased to see that Smoant has already made the change. The Cylon mod has one of the nicest spring-loaded 510 connections I’ve ever seen. It sits in the middle of a 25-mm stainless steel plate that’s screwed on to the top of the mod, and accommodates atomizers up to 30-mm with no overhang whatsoever. In fact, the bigger the atty, the better it looks on the Smoant Cylon 218. The long, rectangular fire button is made of plastic, which I’m not too thrilled about, but works just fine. One thing you should know is that while the button can be pressed all across its surface, it’s much easier to press towards the top, with the bottom half requiring a bit more pressure. The adjustment buttons are located underneath the screen, and together with the micro-USB port create the illusion of an angry face. I don’t know if it was intentional, or if it just turned out this way, but it’s hard to miss. The battery door is hinged and easy to operate, and the battery compartment features spring-loaded contacts at the bottom. It’s the same style battery door as on the iJoy Captain or SMOK Procolor, and it just happens to be my favorite style, so Smoant get a thumbs up for that. 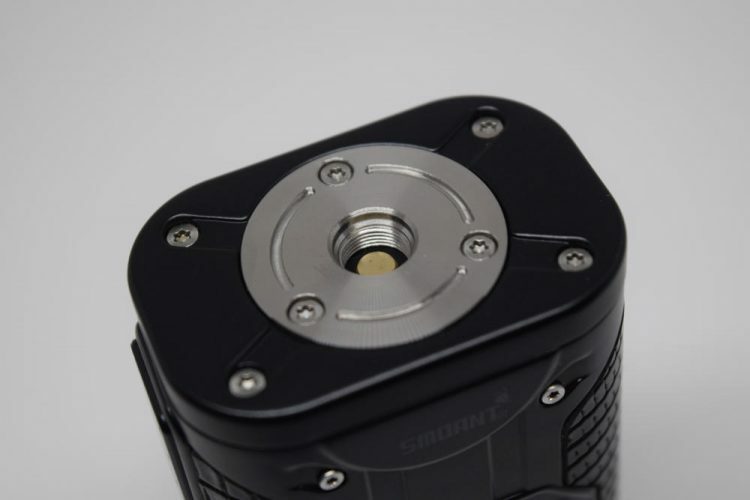 On the back, the Smoant Cylon features a round, white-and-blue acrylic logo. It looks like a button or an LED, but it’s not. It’s just there as decoration. I don’t know if that was needed, to be honest, as the colors don’t really match any other design elements, so it just ends up looking a little kitschy. The Cylon is similar in both same and size to the Captain PD270, but even more so to another big mod, the YiHi SXmini G Class. They’re not identical, but to anyone familiar with the G Class, the similarities are pretty obvious. 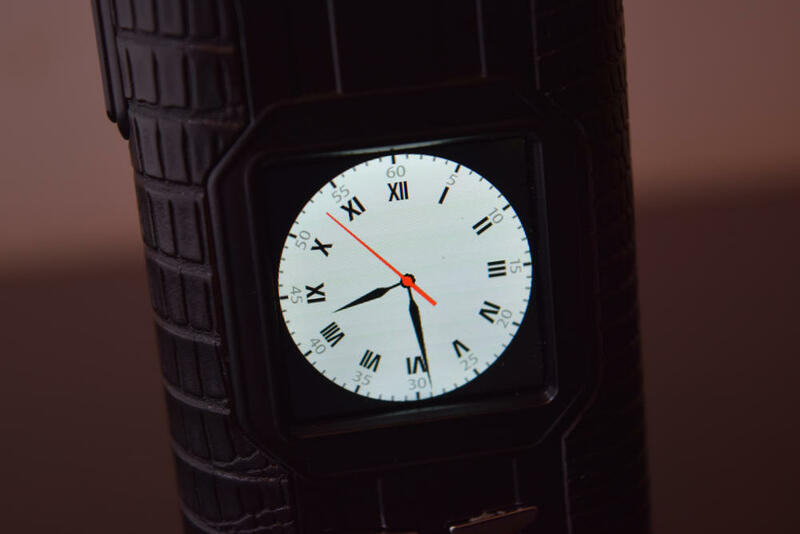 From the positioning of the square display – dead in the center of the mod – and the centered 510 connection, to the gauge layout of the screen and the round clock screen-saver, these two devices have a lot in common. I for one love the look and feel of the Smoant Cylon. 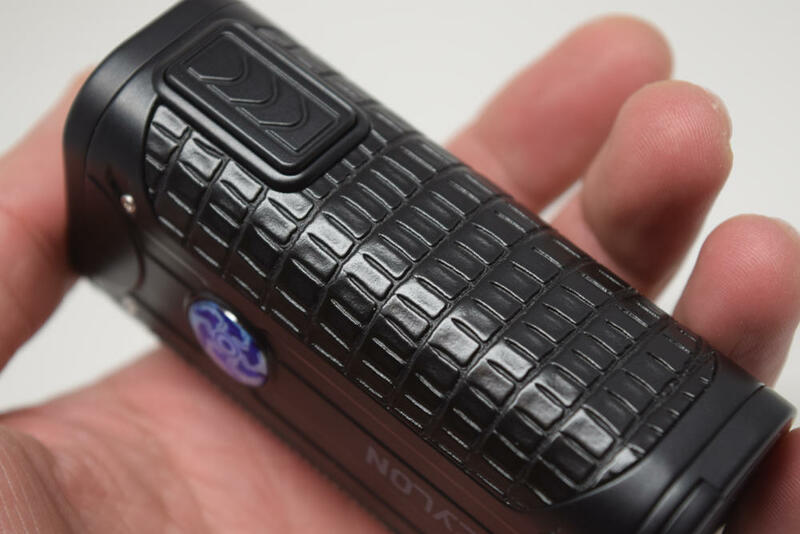 Yes, it’s bigger and heavier than most compact dual-18650 mods, like the Smoant Battlestar, for example, but if you can look past that, this is a really well-made device. 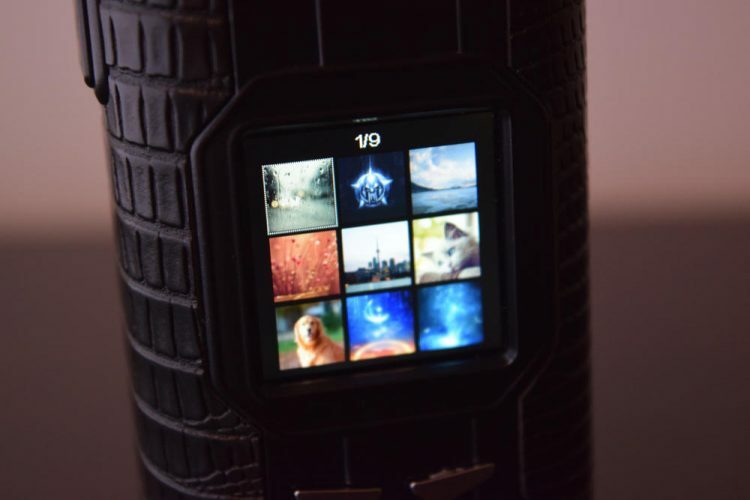 The screen is amazing, as is the centered 510 collection, and the faux-leather is a really nice touch as well. It all comes down to personal taste, but I happen to think that this thing looks awesome. Getting into the menu of the Smoant Cylon 218 is as easy as pressing the large fire button three times rapidly. Once in the menu, you’ll have four submenus to select – VW Mode, TC Mode, Setting and Wallpaper. 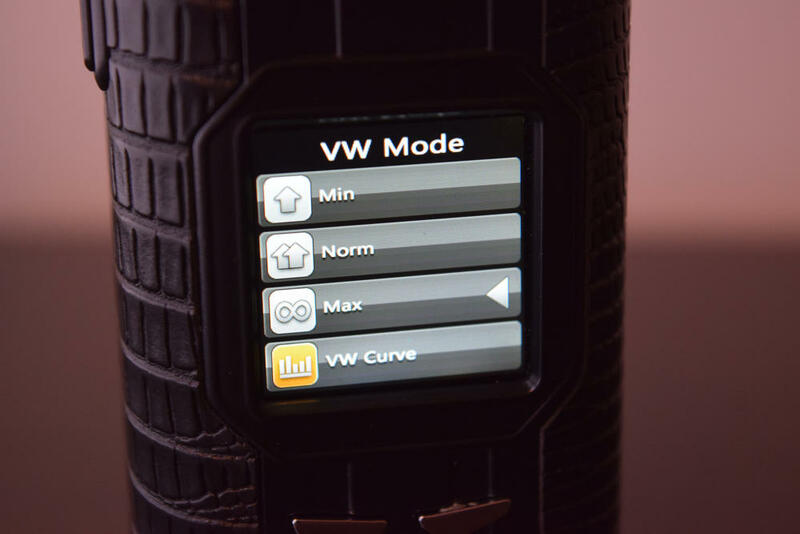 In VW Mode, you can choose between three standard preheat options – Min, Standard and Max – as well as Custom Curves, which allows you to set the wattage for the first 10 seconds of your vape. You adjust each of the 10 bars on screen by short pressing the fire button, then the “+” and “-” buttons to adjust the wattage. Once you’re done with one bar, you press the fire button again to confirm. When you’re done, just use the “+” button to highlight “Enter” and press the fire button again. 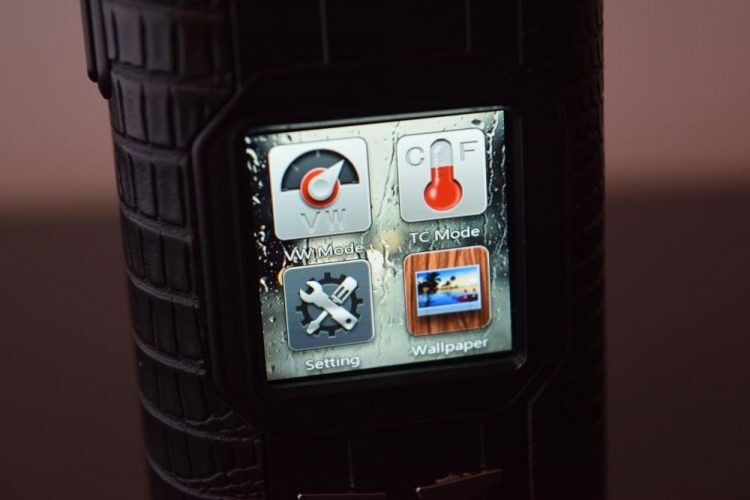 In TC Mode, you can choose from three different materials – nickel, titanium and stainless steel – as well as TCR mode and TC curves, which is pretty much the same as the power curves mode, only for temperature control. In Setting, you can adjust the screen brightness, choose between two display layouts – a classic layout and that RPM gauge I keep mentioning – adjust the screen timeout, and select between a round clock and a wallpaper as the screensaver. There’s also a Factory Reset option, in case something goes wrong with the settings. Finally, in Wallpaper, you can select one of different wallpapers as either the background of the classic display layout, or as the screensaver, which shows up on screen if the mod isn’t used for a few seconds. Nine wallpapers to choose from is nice, but I hope Smoant will add new ones in the near future, or, better yet, allow users to upload their own. That would be really cool. Navigating through the menu is very easy, as long as you remember that a long press of the fire button acts as a “back” button. Otherwise, you just have to wait for the mod to exit the menu after a few seconds of inactivity. Adjusting the power output and the temperature is all done on the home screen, using the “+” and “-” buttons, as is the resistance locking, by pressing “+” and “-” at the same time. If you tap the fire button and the “-” button while in temperature control mode, you can adjust the wattage the Cylon fires at. I really can’t think of a single con for the menu and navigation. Oh wait, I just remembered. This thing round-robins in a very strange and frustrating way. Basically, it never stops. If you keep either the “+” or “-” buttons pressed, it just goes from 1W to 218W and back again on a loop. The same happens in temperature control. Normally, it should stop at the highest and lowest setting and round-robin at the next press of the button. It’s not a deal-breaker, but it’s kind of annoying, so I hope they change it with a software update. But, overall, the menu system and navigation are great. Even though there are a ton of settings you can customize, doing so is simple and intuitive, so you never really feel overwhelmed. Everyone knows Smoant makes some of the best vape mods on the market. No, I’m not paid to say that, it’s a fact, just ask anyone who knows their mods. However, when it comes to battery life, a lot of people seem to think that Smoant mods drain their batteries faster than others. That’s a misconception. Smoant is just more conservative with how low they allow the batteries to be drained. You can check for yourself by trying to use the batteries after a Smaont vaporizer gives you the “Battery Too Low” message in another mod. It’ll probably drain them a bit more. 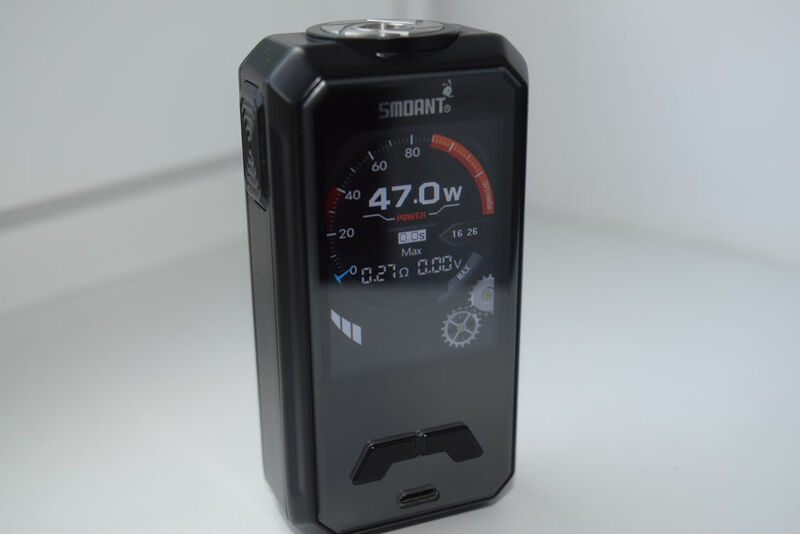 Smoant have acknowledged this issue in the past, and at one point said that they were either going to lower the voltage limit or allow users to set it themselves, but for the time being the Cylon 218 is just as conservative as the Smoant Battlestar and Smoant Charon. That’s not necessarily a bad thing, just something I thought you should know in case you feel that you’re not getting enough out of your batteries. I for one can’t say I’ve noticed a considerable difference in battery life between the Cylon 218 and my other dual-18650 mods. I get about a day of vaping out of it, with two LG HG2 batteries, at around 60W, which is about what I usually get. One thing I haven’t yet figured out is whether the Cylon features 2A fast charging. There’s nothing about this on the Smoant website, and none of the vendors I’ve checked mention it. It should have it, at least, if only because most of its main competitors do. One small gripe I have regarding battery life, is the way it is displayed in the RPM gauge layout. You have a single indicator for both batteries, and it is only displayed in 10% increments. So even if you have 65% battery life, you’ll probably see 60 or 70 percent. It’s not a big deal, by any means, but I really couldn’t think of anything else to mention. As far as overall performance, the Smoant Cylon is an impressive device. 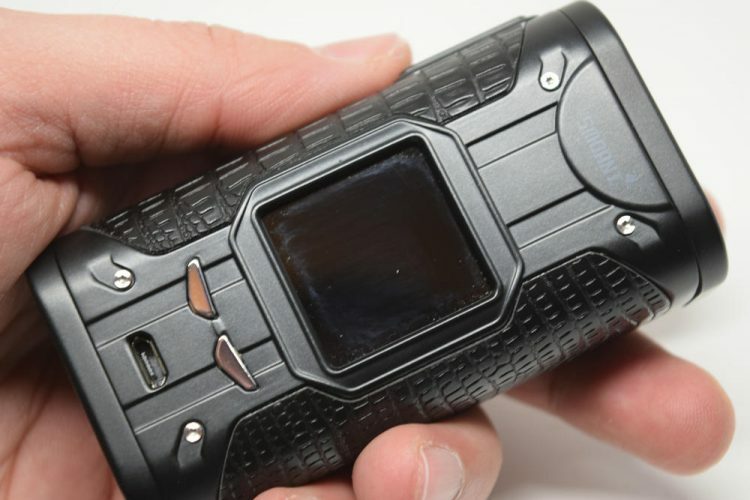 It features the new Ant218 V2, an improved version of the Chinese manufacturer’s proprietary chip, which allegedly makes firing the mod lightning fast. I don’t known if it only takes 0.015 seconds, as Smoant claims, but it definitely feels instantaneous. The ramp up is also very impressive, especially in the Max preheat setting. I haven’t used it at over 100W, so I have no idea if it is indeed capable of outputting 218W. I honestly don’t care about that, as I for one would never vape at that level, but if you’re curious to know, I suggest waiting for Daniel DJLsb Vapes’ review. All I can say is that the power output feels accurate at 60W – 80W. I don’t have a lot of experience with temperature control, as I hardly ever use it, but I can say that it passed the cotton test with a couple of stainless steel coils. In real-life vaping conditions, I found that you need to bump up the temperature a bit more than on other mods in order to get a satisfying vape, but I don’t consider that a big deal. Finally, this may not be relevant to the performance of the mod, but I just have to mention how satisfying it is to use the Smoant Cylon 218 in power mode with the RPM gauge layout. The needle actually moves every time you press the fire button, and it stops at the exact wattage you’re vaping at. It’s pretty darn cool. The Smoant Cylon 218 is an impressive device. I love both the design and the way it feels in the hand thanks to the quality materials used, and that color screen with its various layouts and wallpapers is really cool. the centered 510 connection is another big pro, as are all the different built-in features and customization options. I wish it was compatible with larger batteries, to justify its bulky frame, and I’m not a big fan of that round decorative thing they used, or the plastic fire button, but I’m just nitpicking at this point. 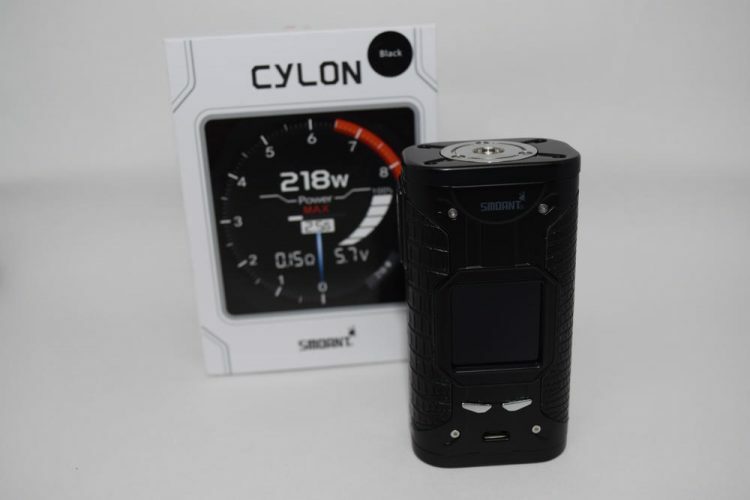 The Cylon is a really solid dual-18650 mod, so if you’re in the market for one of those, I suggest you at least consider it. If you need an extra reason to love the Cylon 218, how about it price? This thing goes for around $60, which is a pretty sweet deal for such a high-quality mod. Do not buy this junk and don’t buy anything that says smoant. My screen also has went blank and smoant won’t stand behind their product.